Photo: Scott Douglas (left) and Shaun Bowie (right) founders of DVS the CCTV products and services specialists. 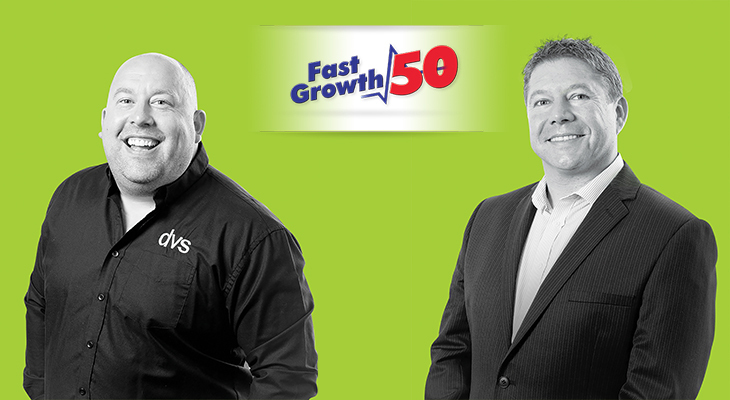 The security products importer and distributor, DVS Ltd have placed 24th at the 2014 Western Mail, Welsh Fast Growth 50 awards. This year’s awards were based on company growth achieved through 2011-2013. During this short period DVS managed a whopping 146.5% increase. DVS has seen vast organic growth since its start in 2003 and with a projected turnover exceeding £10million for the current financial year, they are sure to improve their position on next year’s list. The Cardiff based company have experienced huge growth by focussing on innovative and emerging technologies since their inception in 2003. In recent years they have secured the distribution rights for forward thinking security based companies HikVision and Prism Skylabs. “We are extremely proud to be included in this list. As a company we believe in our staff and we simply couldn’t have achieved this without the collective team effort of everyone at DVS! We believe in organic growth and will continue in this manner. DVS will be moving to a larger building next year to support projected sustainable growth to £20m in the next 5 years.